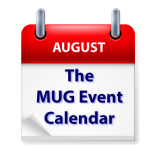 The busiest week of the month is up on The MUG Event Calendar, in spite of a number of groups still being on summer hiatus. Author Lesa Snider will address a Texas group on the subject of Apple’s photos, an examination of voice assistants is set for a Carolina group, and the many uses of iCloud will be the main topic at an Oregon group. Affinity Photo will be talked about at a New Jersey group, and iBooks is on the agenda at a Nevada group.